Contains exactly the same active ingredients as Frontline Plus. You get the same fast, effective and convenient treatment and control of fleas, ticks and chewing lice at half the price of the brand name Frontline Plus! I always buy my pet meds from Pet Shed! My vet says they price match, but when they see the amazing deals I get from Pet Shed they can't match it. I order everything here, one low shipping fee and no back and forth trips to the vet. So simple. I wish everyone knew how easy this is. 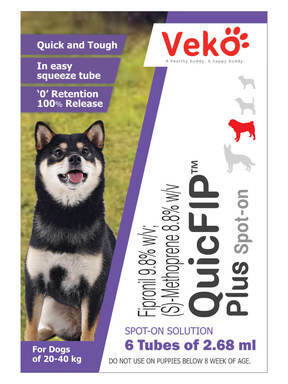 This product works very well and is a much cheaper alternative to Frontline. Just a warning to anyone that hasn't tried yet - it does have a strong fish smell that lasts a day, maybe 2 at most. But it does go away. I would recommend this to anyone wanting a cheaper alternative. The current stock expires in May 2018, so unfortunately could only buy the 6 month supply when I was hoping to buy a 12 month supply. Everyone who came here to say this product can save us lots of money! It's just amazing! This works well though there are downsides like the smell but overall this is amazing! What's important is it works the way it is supposed to be. This product is as effective as the original brand and it really works well it's just that the smell of this is a lil bit strong. But anyway I have saved a lot of savings and made my baby safe. It's like I hit two birds in one stone with this Product! Thanks Pet Shed! Cheers! Kills fleas on my cats instantly. Great product to use. COMPARED TO THE BRANDED, GENERIC FRONTLINE PLUS IS MUCH MUCH CHEAPER. I LOVE ITS PRICE. THANK YOU PET SHED! Great alternative to vet's expensive prices!! A tight budget is really not a problem to Pet Shed! I bought this 2months ago and so far I'm very happy with the results. Fleas were really lessen in just one application! I can't wait for all of those fleas to be gone. Buy generic frontline plus and you'll love it. You'll actually love the savings!